As we wrap up the fourth week of the legislative session, testimony continues and bills are starting to take shape. We continue to educate lawmakers about our top goals for the year — including long-term clean water funding, climate action, better protections from toxic chemicals, and modernizing Act 250. The Senate Committee on Natural Resources & Energy took extensive testimony this week on clean water initiatives and funding needs. The committee is also looking at how to disperse clean water funding in a manner that will effectively get money on the ground to high priority projects that will put us on track to achieve our clean water goals. We will continue pushing lawmakers to enact a new, dedicated long-term revenue source for clean water, and a transparent, accountable mechanism for getting that funding to high priority clean water projects. Following the release of our Climate Action Plan for 2019: A Blueprint for Progress, testimony is underway in the House Energy & Technology Committee, as well as the House Transportation Committee on climate policy solutions. We continue to advocate for lawmakers to make progress on the six-step Climate Action Plan we proposed, which will make a real difference in helping Vermonters — particularly lower income Vermonters — weatherize their homes, buy efficient vehicles, and hold the state accountable for meeting its climate pollution commitments. Learn more about what’s happening on energy and climate change with our LIVE Climate Dispatch from the State House, posted every Friday of the legislative session. Click here to view this week’s Dispatch, and sign up to receive the video in your inbox byclicking here. Testimony continued this week on two toxic chemical bills. 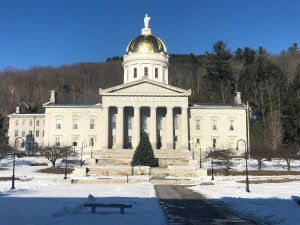 The Senate Education Committee worked hard on a bill to ensure that drinking water in all Vermont schools and childcare facilities is tested for toxic lead contamination, and any contaminated water supplies are cleaned up. In the budget address, the Scott administration announced its support for $1.3 million in funding lead testing for all schools, which is a good initial step. We’ll continue working to ensure the bill is protective of children’s health and implemented quickly and effectively. In the Senate Judiciary Committee, testimony continued on legal remedies to help Vermonters harmed by toxic contamination. Industry lobbyists are working hard to weaken the bill, but we will be standing up to protect Vermonters’ rights and hold toxic polluters accountable. The House Natural Resources, Fish & Wildlife Committee spent a lot of time this week on proposed Act 250 modernization legislation, building off the recommendations in the report produced by the Act 250 Commission. VCV will be working to ensure Act 250 modernization proposals will better protect our natural resources and address challenges like climate change, while supporting our working lands and traditional settlement patterns. As you can see, lawmakers are hard at work on many environmental priority issues. However, we’re always outnumbered at the State House by corporate lobbyists, so legislators need to keep hearing from people like you. They need to know that Vermonters care about these issues, and want to see real progress. Stay tuned for updates each week of the legislative session, and for specific ways you can get involved.